Point of contact for inquiries about product reviews. Point of contact for inquiries about advertising and general Madshrimps questions. 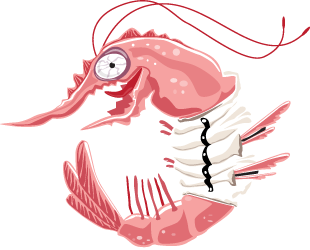 The Madshrimps website is a collaborative effort of many hardware enthusiasts; Started in January of 2002 the aim of this website is to provide readers from around the globe with information on the latest hardware available, and provide entertainment in the form of PC case modification work logs, overclocking adventures and twisted video-reviews. The name of the website can be traced back to the roots of the start-up crew, all members of a Belgium gaming website called “the Gaming Shrimp” or in Dutch “SpelletjesGarnaal”. At their forums the future Madshrimps crew was known for their extensive hardware experience and because they actually opened their PC cases they were called “mad” (crazy) by the other forum members. So the term “Madshrimps” was born. Over the years we have grown in numbers, adding international reviewers to the reviewer’s roster. We also feature guest articles from known individuals who linger in popular Hardware Forums. The products we review at the site are borrowed from local shops and retailers, often we pay for freights both ways, without their continued support this site would have less content. We don’t shy away from buying the products we think deserve extra attention; sometimes manufacturers contact us for product reviews or we contact them. The bottom line is that it does not matter how the review samples are received, we try our best to report to you, the reader, with unbiased findings and share our opinions. We seldom recommend a reviewed product and don’t use an award system; we do compare products with others alike and offer the reader all the information to draw a definitive conclusion. We feel consumers deserve the best in quality, performance and price. The site is written in English; while the mother tongue of some crew members is very different, we thrive in knowing that in this multi-culture environment we have a common goal. Nobody is perfect and sometimes we also make mistakes, but we admit to making them and we improve our testing and evaluation methods constantly to offer the reader the most valuable read. Our reader forums offer hardware enthusiasts and newcomers alike a place share their experience and ask questions. We do our best to keep create a friendly atmosphere where people can learn and discuss their favorite pastime.